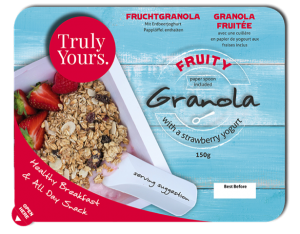 Truly Yours’ Joe O Connor describes the easy to eat product as “a perfect solution to a simple healthy breakfast and convenient all day snack.” The innovative design features recyclable packaging which doubles up as the dish from which to eat the contents and incorporates an innovative paper spoon. 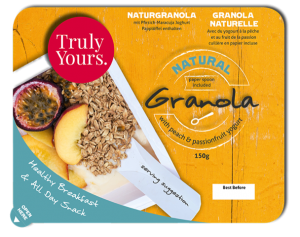 The combination of granola and yoghurt has become a very popular breakfast and snacking option. When consumed alongside a healthy diet it can aid in weight loss due to its very low levels of cholesterol and sodium. Granola can also help to reduce appetite due to its high level of fibre, making the body feel fuller for longer. 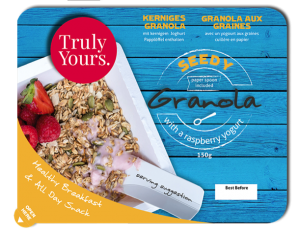 The Truly Yours granola/yogurt snack packs are 290 – 315kcal per serving. 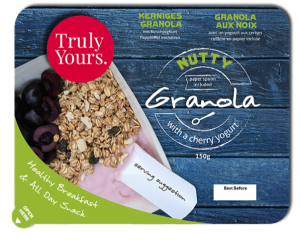 As an ambient product with a long shelf life, the Truly Yours granola/yogurt snack pack has enjoyed significant success to date having been well received by the airline industry and is expected to be popular with vending machine operators, retail travel locations and service station operators. Our product vends easily and lends itself to be positioned in any snack machine offering consumers a nutritious alternative.